With autumn upon us and the rain and wind finally catching up, we’ve begun many of the tasks that have to be carried out in order to put the garden to bed, ready for the winter months. The Cottage Garden, famous for its hot colours, has created a constant and exuberant display throughout the season that’s not to be missed. Dahlias, cannas, sunflowers and roses all work together to create a multi-coloured mosaic that, during summer, is filled with scarlet reds, log fire yellows and sunset oranges. Because of its hot coloured theme, the Cottage Garden is blessed with a diverse range of plants, which each have their own requirements from pruning, lifting or dividing, and it can be a real joy to garden within, as well as a morale boost during the bleaker days of October. So here are a few of the jobs that we, the gardeners, enjoy the most. Above the front door on South Cottage. In true Sissinghurst and Harold fashion, the Cottage Garden contains four Irish yews ‘Taxus bacata ‘Fastigiata’ at the centre of the garden which, when stood between them, create a sense of slight claustrophobia, as though four giants are standing over you. These giants, however, must be cut to create a neat clipped form. So the task at hand fell to Wendy and I, and with our newly serviced battery hedgecutters we began to mould edges and shave sides. A very enjoyable task for anyone with slight OCD when it comes to hedge cutting; nothing can beat the cutting of yew whether it’s hedge or peacock. However cutting something so tall inevitably results in a high climb and Sissinghurst is certainly not short of a vast array of ladders. Wendy at work on the yew. Wendy cutting the very top. The major of tender perennials in the Cottage Garden are cannas and dahlias, which put on a fantastic array of colour over summer. However, we must lift them in order to secure their safety from frost over winter. Liz, our student gardener was responsible for the removal of the tenders this year and went about cutting them down, lifting them from the summer compost and placing them in the greenhouse. From there we allow the moisture to leave the tubers to stop the risk of rotting during their winter slumber. They will then be placed in bark in a frost free environment until planting the following year. Liz had one obstacle in this task however, and it was not some kind of catastrophic or complicated horticultural set back but in fact the visitors looking on in horror and pleading with her whilst she cut down the full flowering dahlias. However, frost has been late this year and what would normally be browned petals are still gleaming as if it were still August. Dahlia coccinea drying out in the glasshouse. Jo went about pruning the climbing rose Rosa ‘Madame Alfred Carriere’, which clings on to South Cottage, the cottage that gives this garden room its name. This is where Harold and Vita both slept and ‘Madame Alfred Carriere’ is supposedly the first plant they planted, so it carries great historical merit. 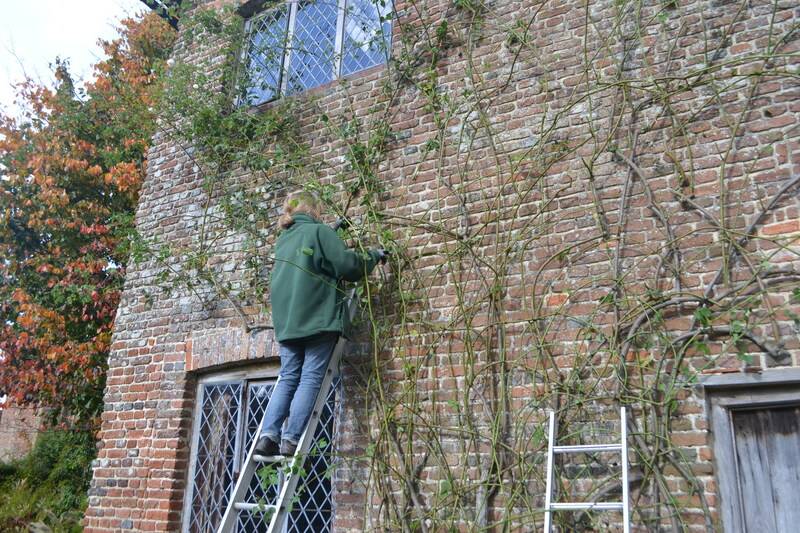 In classic Sissinghurst rose pruning fashion, Jo cut back all flowering shoots to one or two buds, removed some of the older wood and used new healthier growth to create a framework on the wall that is designed to promote maximum flowering as well as a beautiful and intricate look. But the cottage garden isn’t just restricted to summer. In spring, highly fragrant wallflowers are complimented by various hot coloured tulips such as ‘Aladdin’ and ‘Orange Emperor’ which force open our eyes after many bleak and colourless months. This illustrates another reason why the tender perennials have to be removed as it opens up spaces for our wallflowers, which are directly lifted from our biannual bed. When the tenders have been removed, we gently fork the soil, adding compost to boost the soil for the new arrivals. Finally, when the wallflowers have been lifted from the nursery, we make sure they are laid out as though they have seeded and drifted through the borders in true Vita fashion. Liz working in the Cottage Garden. This entry was tagged autumn, cottage garden, Sissinghurst. Bookmark the permalink. Lovely informative blog with brilliant photos. Thank you so much for taking time to do these blogs, they can brighten up a dreary day. Hi David, interesting that you lift your Dahlias, I know a few people and places that also swear by it. However the reason we take ours out is so we leave nothing to chance. We can’t predict if this winter coming will be particularly frosty or like the last winter, a constant down pour. If we had left them in last year I’m pretty sure that they would have rotted with the amount of sitting water we had in the garden, thanks to our good old Kentish clay, but more importantly we also need the space for our spring display of wallflowers and tulips. 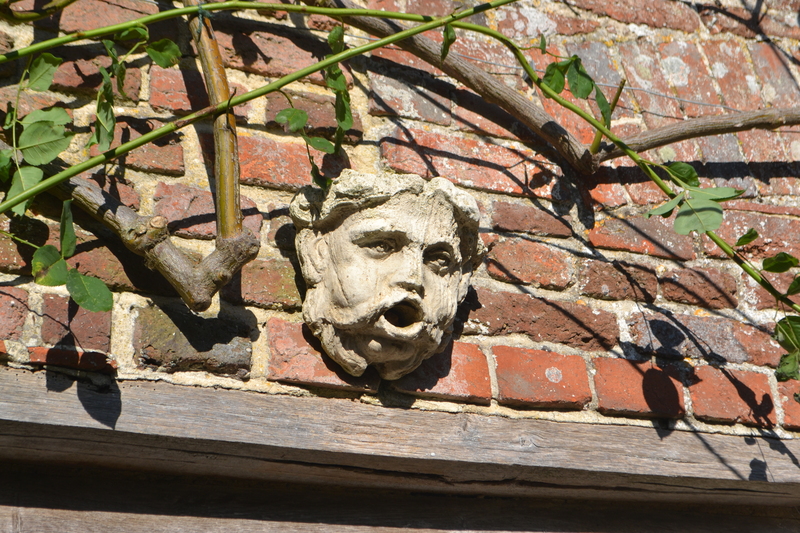 Pingback: Moseplassen - livet i hagen | Fantastiske Sissinghurst, bli med ut i The Cottage Garden!